If you like root beer, you like sassafras. The aromatic bark, leaves and roots of this little tree are believed to be the first plant exported from North America to Europe, back in the late 1500s. All parts of this little tree make for delicious — and different — teas, sweets and other confections, and sassafras commanded exorbitant prices in Europe… until everyone started drinking sassafras tea to cure their syphilis. Soon no one wanted to be seen sipping their syphilis cure in public, and the sassafras trade withered. More recently, sassafras has been getting a bad rap by the folks at the USDA, who say that the active component of sassafras, safrole, is a “known carcinogen.” Why? They gave tons of pure safrole to rats and the rats got cancer. Later researchers noted that, like the whole saccharine scare in the late 1970s, safrole seems to cause cancer in rats — but not people. Still, many people still think that sipping sassafras tea or eating sassafras ice cream will doom you to a date with your oncologist. Just know that there are many times more “known carcinogens” in a bottle of beer than there are in any homemade sassafras product you might make. By one calculation, you’d need to drink 24 gallons of sassafras root beer a day for an extended time to get the amount of safrole fed to those rats. I collect sassafras on Cape Ann, where my family lives. It’s easy to spot its telltale mitten leaves. Sassafras is unmistakable. It is a spindly, shrubby tree that lives beneath larger trees. Its upper bark is green, and the leaves come in three varieties, often on the same branch: a mitten, a three-lobed leaf, and a simple spear-shaped leaf. The way you collect sassafras is to pull seedlings right out of the ground. I know, it sounds destructive, but it isn’t. Sassafras grows in clumps, and the parent tree sends out suckers under the ground, which then become seedlings; it’s a lot like mulberry. You find a clump — look for at least 8 to 10 treelings scattered about — go to one about 2 or 3 feet tall, grasp the very base of the tree and yank it straight up. You should come away with the seedling and about 10 inches’ worth of the root. You did not get all of the root, you know, and this is a good thing. It will regrow later. So what seems a little destructive is actually good for the sassafras cluster — it lets the surrounding seedlings grow with less competition. All parts of this tree are useful. Notice I did not say “edible,” because the leaves are the only part you actually eat. You know them as filé powder, and without sassafras leaves gumbo just isn’t gumbo. Roots on the left, twigs on the right. What’s the difference? They make very different teas. The twigs have a lemony-floral flavor and aroma that one author has compared to Froot Loop cereal — not exactly a selling point in my book, but they are lovely. The roots, however, are the “root” in root beer. I am not a tea drinker. Coffee is my breakfast drink of choice. So I was not about to switch for sassafras. But I do like using flavored syrups from wild ingredients; I recently made a delicious fir tip syrup from the young tips of a Douglas fir tree. I then use these syrups to glaze meats, make homemade sodas, sorbets or ice creams. 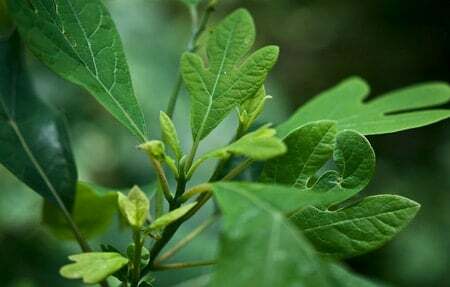 Sassafras is a prime candidate for this treatment. 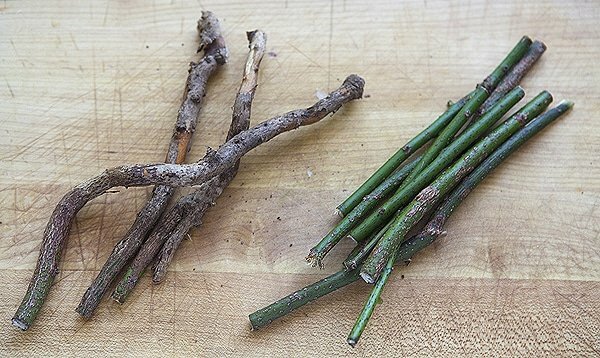 To make a twig syrup, you peel back the green bark a bit to expose it — the bark is what has most of the flavor — then simmer the twigs in hot water. The brew quickly turns a pretty amber, a little like cola. Let it steep overnight and then strain it through cheesecloth and mix it 1:1 with sugar to make a simple syrup. It is outstanding. I mean, really outstanding. Think root beer with a lot of lemon in it. To make root beer syrup, the first thing you need to do it chop the sassafras roots. 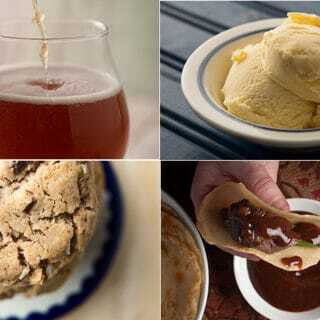 Sassafras is the prime flavor in root beer, but not the only one. Root beer is a concoction of many things. 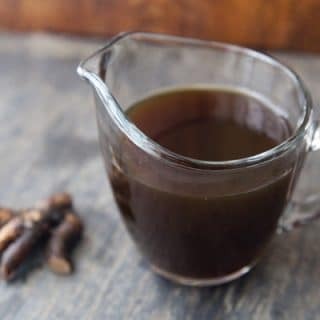 My recipe is heavy on the sassafras roots, plus some burdock root, molasses for color, one clove, a star anise, some coriander seed and one drop of wintergreen extract. It really does taste like store-bought root beer! Maybe not the root beer you get in a can now, but then that no longer has any real sassafras in it. It is warm, and zingy, and, well, deliciously rooty. If you live near sassafras trees — and you do if you live east of the Great Plains, south of Quebec and north of Orlando — by all means make this syrup. If you don’t live there, or don’t feel like foraging, you can buy sassafras root bark online. You’ll never go back to store-bought root beer again. 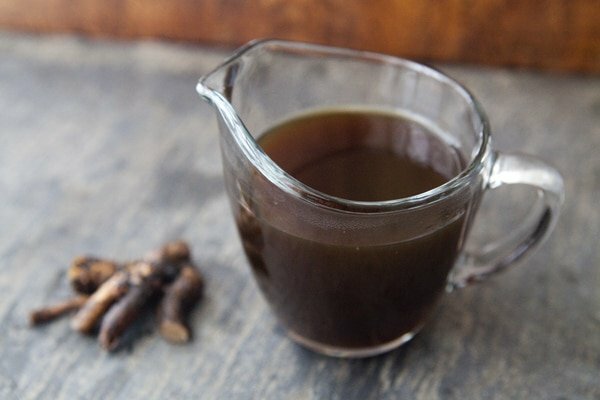 You will need some unusual ingredients to make this, notably sassafras roots. If you happen to live in the United States or Canada east of the Great Plains, you are in luck: Sassafras grows everywhere in that region. If you don’t live there, or don’t feel like foraging for your own sassafras, you can buy sassafras root bark online. The burdock in the recipe grows all around you as a weed. Otherwise, many good supermarkets have burdock in the produce section: They are long pale, skinny roots often sold under their Japanese name “gobo.” If you absolutely cannot get your hands on burdock, use dandelion roots. The root beer will be different, but still fine. If you can find it, get wintergreen extract. If not, use peppermint extract. You can find all sorts of recipes for wild drinks — soft drinks as well as booze — right here on Hunter Angler Gardener Cook! Hank… you are awesome. So enjoy everything you do. Cant wait yi try this recipe! 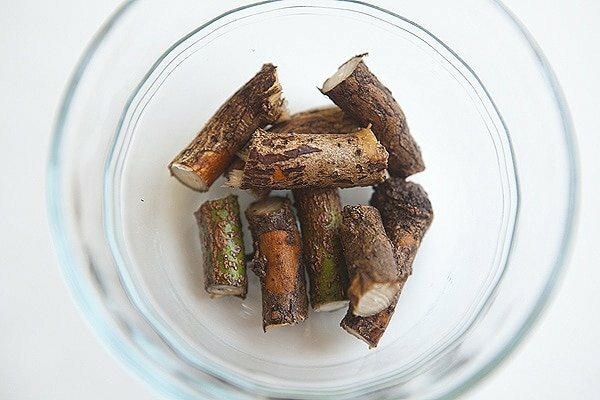 3 ounces of dried or fresh sassafras roots? and does it make a difference what season you collect the roots? I’ve been wanting to do this for so long–but these questions stop me! Amy: I generally use dried. I am not sure if it makes a difference in terms of season.